St. Benedict was sent to Rome from his home in Norcia to further his education. While in Rome, he lived in a house, a domus, owned by his parents. As a member of a wealthy family, a staff accompanied him to maintain the house and care for his needs. Saint Benedict was about 14 when he came to Rome, and probably stayed about 4 years. I had the chance to visit this domus, now the church of San Benedetto in Piscinula in Rome. It was converted to a church dedicated to Saint Benedict, fell into disuse and then ruin, and was ultimately re-opened and re-dedicated at a time when the region had few residents – in thanksgiving for a cure. At present, the Heralds of the Gospel have charge of the church, and provide warm hospitality to visiting Benedictines, allowing us to visit and stay near the small room – a passageway, really – where St. Benedict lived in Rome. At the time of our visit, the Heralds were still celebrating the return of a fresco which had been ripped from the wall by thieves but recovered, years later, by the police. 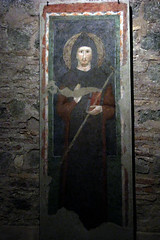 It shows a young Saint Benedict, as he was before leaving his studies and beginning his monastic journey. Restored, it now hangs on the inside of the church where it can be better protected. After the visit, I discovered a TV news story with wonderful interior photography that gives a good sense of the place.